The Lima Fire Department responded to a collision between a car and an Allen County Sheriff’s Office cruiser at the interssection of West McKibben and North Elizabeth streets around 8:30 a.m. Tuesday morning. 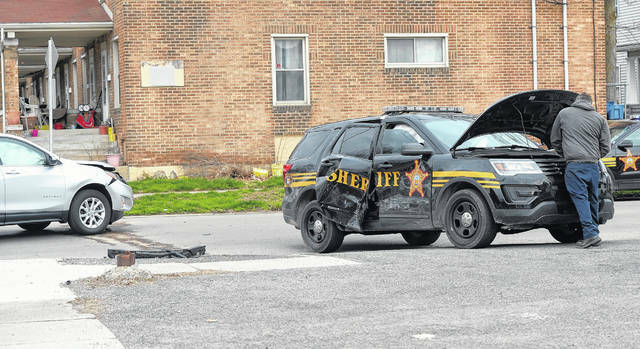 LIMA — An Allen County Sheriff’s Office deputy and an inmate of the county jail suffered minor injuries when the patrol vehicle in which they were riding was involved in a two-vehicle accident Tuesday morning. According to information provided by the sheriff’s office, a patrol vehicle driven by Deputy Chuck Ganson was traveling northbound in the 500 block of North Elizabeth Street shortly before 9 a.m. when the cruiser was struck by a 2019 Chevy Equinox driven by Kenneth Theissen, of Covington, Kentucky, that was westbound on McKibben Street. Theissen was issued a citation for failure to yield the right of way at an intersection. At the time of the crash, the patrol vehicle was transporting an inmate from the jail to the Western Ohio Regional Treatment and Habilitation Center. Both the deputy and inmate were transported to Lima Memorial Health System for treatment of non-life threatening injuries. Theissen had visible scratches and abrasions but did not request treatment. The patrol vehicle was disabled. https://www.limaohio.com/wp-content/uploads/sites/54/2019/04/web1_car-crash-RP005.jpgThe Lima Fire Department responded to a collision between a car and an Allen County Sheriff’s Office cruiser at the interssection of West McKibben and North Elizabeth streets around 8:30 a.m. Tuesday morning.